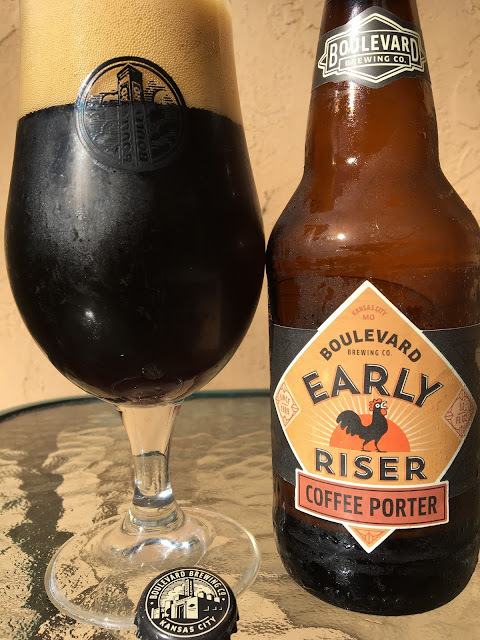 Boulevard Early Riser Coffee Porter? Um, yeah! That site tells a great story about the origins of this beer. My can says 5.0% alcohol (despite the 5.2% on the story from a year ago). 28 IBU. Rooster on the label is nice. Wow! Awesome coffee aroma with some chocolate and roast lingering, just delicious! Same with the flavors, terrific. Rich and delicious coffee, creamy texture. Plenty of great roasty goodness. Chocolate, hints of caramel and raisins. Loved it!